Sending a teen to a drug-treatment center might be one of the hardest decisions a parent has to make. However, getting help early can mean the difference between future substance use and a healthy life. An adolescent’s developing brain is more vulnerable to drug and alcohol use compared to an adult’s. This means drug use will have severe negative impacts that might not be reversible. So if you suspect your teen has an addiction, you need to get help right away. Unfortunately, you may encounter resentment and anger on your teen’s part after making this decision. Unlike you, he or she doesn’t have the experience or foresight to understand how drug addiction will impact his or her future. To make this a smoother process, you need to find the right rehabilitation center for your family. Due diligence and research will better prepare you. 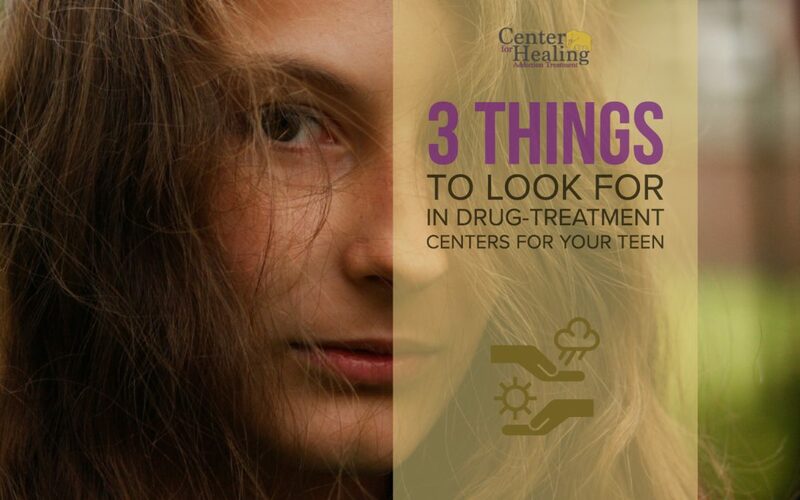 To help get you started, here a few things to look for when searching for the best drug-treatment facility for your teen. A big concern for parents is how their child’s education might be impacted by treatment. No one wants their child to be left behind at school, which can cause detrimental effects on intellectual and emotional growth on top of all the other issues happening right now. When searching for a treatment center, make sure it has a steady plan that complements your child’s schoolwork. Maintaining a similar academic trajectory with peers will keep your child from falling behind. Facilities should provide master’s-level clinicians, psychiatrists, and doctors that cater specifically to teenagers. After all, the treatment needs of adults differ dramatically from the needs of teens. Factors like brain development and hormonal changes need consideration when creating treatment plans for young adults. Drug-treatment centers for teens require a knowledgeable staff that understands the rapid growth of adolescents and how to properly care for them. After your teen undergoes a psychological and medical assessment performed by a team of professionals, an individualized treatment plan will be created. You, your child, and the treatment team will discuss goals, duration, and course of this plan. Your teen will participate in individual therapy along with group therapy, with the latter taking place with a group of his/her peers. Counseling offers a crucial support structure needed to address personal feelings along with a way to uncover the root cause of the addiction. Make sure you understand the timeline and content of the treatment to ensure it aligns with your family’s values. Getting the family involved in recovery uncovers essential tools for everyone, not just the child. This type of therapy helps teens and their families work through issues that might be contributing to the addiction. This popular therapy uses a teen’s natural internal motivation to create positive behavior changes. Teens reluctant to change benefit from MI because it helps them become more positively driven to make better decisions. Some cognitive professionals believe that destructive behaviors come from a cycle of unhealthy thoughts. Using CBT, patients change these thought patterns and replace them with healthier ones. For example, your teen might identify certain triggers and find alternative ways to cope rather than use drugs. Similar to CBT, this type of therapy promotes mindfulness, acceptance, and regulating emotions. Teens will learn new skills to effectively cope with distressing feelings, which will lead to positive changes in behavior. When choosing the right drug-treatment center for your teen, consider one that provides academic enrichment, a staff that understands teenagers, and a specialized care schedule. Getting your child the help he or she needs as soon as possible is the best way to ensure a full, healthy life. At Center For Healing, we are here to help you and your teen if needed. Please contact our professionals today if you have any questions.